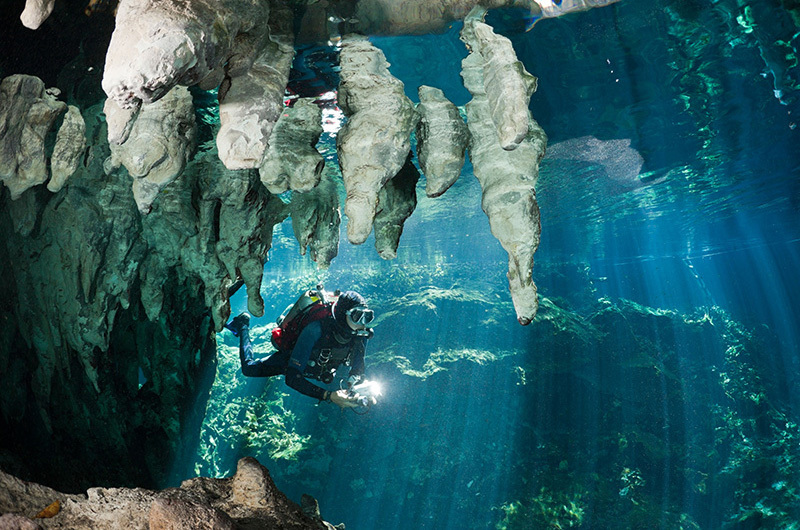 Tulum is home of some of the best cave & cavern diving in the world. The nearby cenotes are created over thousands of years when the limestone bedrock collapses or erodes, exposing these vast underground tunnel systems. The 2nd longest underground tunnel system in the world is located only 5 km from Tulum. 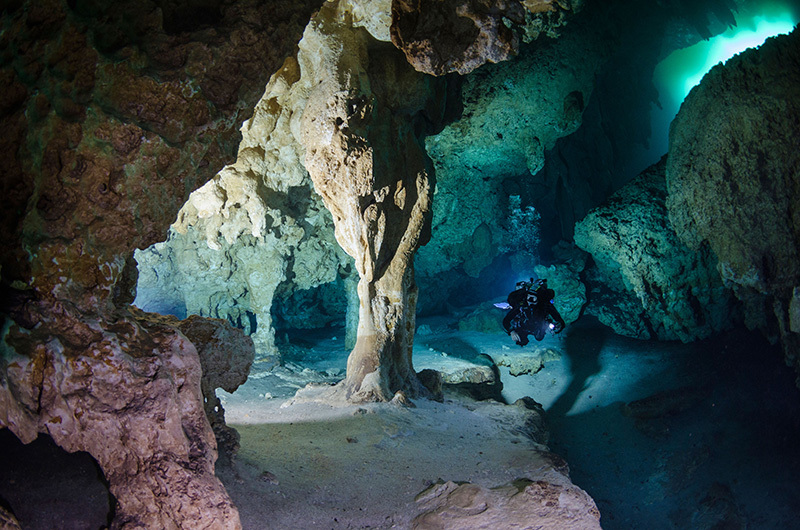 Explore this magical underground world with Quintana Roots Dive Center. For those with no experience who want to learn how to scuba dive to those with open water & advanced open water certification, QR Dive Center has the highest level of guides ready to take you on an adventure through the Maya underground. 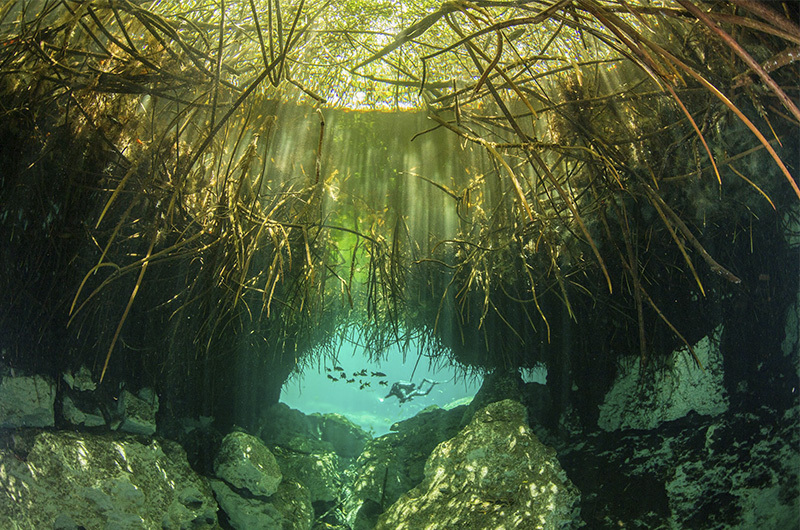 Casa Cenote is a beautiful mangrove cenote located about 20min north of Tulum and only 60m from the Caribbean Sea. It offers a wonderful experience for both seasoned divers & inexperienced divers alike . The snorkeling is also very good. The close proximity to the sea means that there is considerably more marine life in this cenote than others. Depth 7m. Dos Ojos. 25min north of Tulum. The two large cenotes “two eyes” are the most famous cenotes locally. A vast underground cave system offers divers and snorkelers of all levels an opportunity to marvel at the phenomenal stalactites and stalagmites. The area is so large that we do two dives here. Depth 10m. 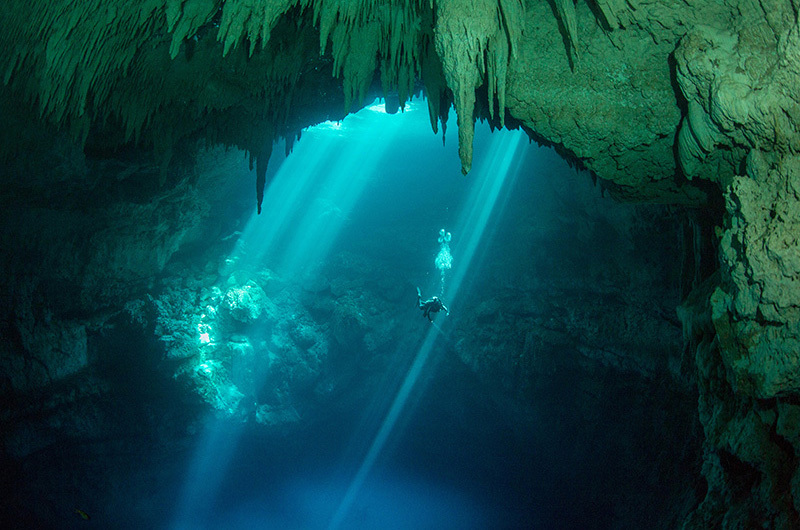 The Pit is the most awe inspiring cenote dive. Located 30min north of Tulum. This vast underground chamber is surreal in its size. A deep dive for those with Advanced Open Water or Open Water certification with a deep diver training course. Discovered in 1996 and only opened fully to the public in 2012 it is a must dive for any serious diver. Depth 40m. Angelita or little angel is a cylindrical sink hole that descends down to a maximum depth of 60m. Located 20min south of Tulum. 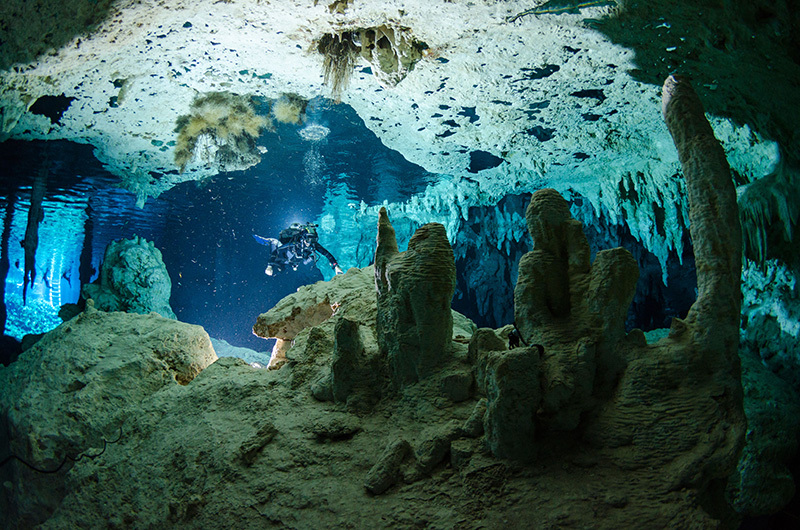 It differs from other cenotes in that it has no cave connections. The Hydrogen Sulphide cloud at 30m is thick. 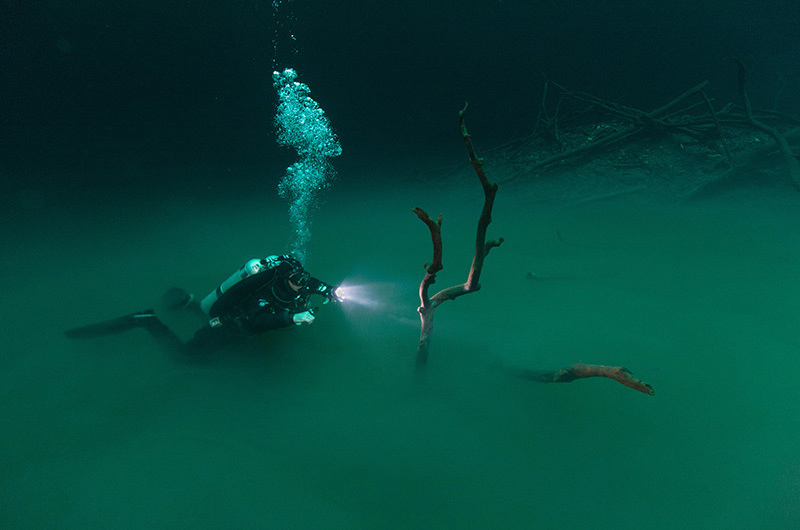 As we descend beneath it, all the natural light is blocked out as we dive in between the cloud & the trees that have fallen into the cenote over the years. A challenging deep dive, not for the faint hearted. Depth 40m. Calavera or the Temple of Doom is situated just outside the city limits on the road towards Coba less than a 5 mins drive. A 2m drop into a 5m diameter hole takes you into one of the most thrilling and exciting Cenote dives in the area. Intense green light marks the entrance above the Halocline and blue below. The flowstone cave features could be modern art. The Halocline is the highlight and has to be seen to be believed. Depth 16m. © 2019 Quintana Roots All Rights Reserved.